Near Deer Lake in Newfoundland, Canada, a popular tourist attraction is the Newfoundland Insectarium and Butterfly Pavilion where one can watch a tropical butterfly feeding in the garden. Bright pink flowers adorn the garden in the Butterfly Pavilion near Deer Lake, Newfoundland and the first visitor is one of the tropical butterflies. As the flowers blossom in the garden, a butterfly stops for some feeding time giving visitors plenty of time to observe this fascinating part of nature. Over 500 species of butterflies reside in this tropical garden at the Newfoundland Insectarium and Butterfly Pavilion near Deer Lake and each butterfly prefers a certain type of flower for feeding. The butterflies in the tropical garden can also enjoy a small pond with goldfish and koi which makes their habitat seem more like the wilderness. The possibility of a butterfly landing on one's shoulders while in the pavilion is not uncommon, creating a memorable photograph for visitors. When leaving the Butterfly Pavilion, one must ensure they do not have butterflies attached to their clothing and release these tropical insects into the wild. 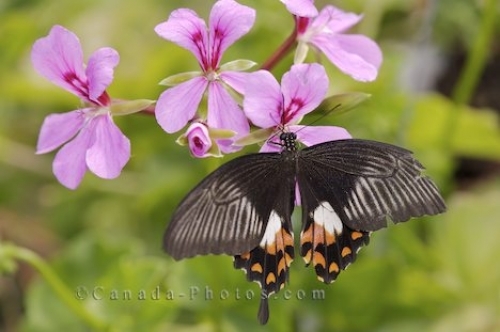 Picture of a butterfly in the Butterfly Pavilion near Deer Lake, Newfoundland feeding on a tropical flower in the garden. Live tropical butterfly in the Butterfly Pavilion at the Newfoundland Insectarium and Butterfly Pavilion near Deer Lake, Highway 430, Viking Trail, Trails to the Vikings, Northern Peninsula, Great Northern Peninsula, Newfoundland, Newfoundland Labrador, Canada. The Newfoundland Insectarium and Butterfly Pavilion was opened in 1998.